Geared towards children, this year’s October event was a lively one. Kids munched on popcorn while they created colorful art projects, marveled at bats, made fanciful masks and even touched live creatures. Music swirled around parents as they watched their children sing and dance happily in front of the band. 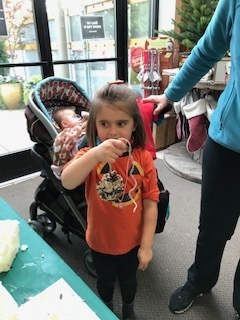 The YEC booth was tucked into the corner across from an area luring shoppers in to buy bird books, suet and feeders—a good place for the Barn Owl to watch over the other bird mounts and to pique people’s interest as they strolled by. The bird identification matching game challenged both adults and children. But the biggest draw for kids was making pine cone feeders to hang up in their yards. They swarmed the table eager to pick a pine cone, cover it with shortening and roll it in seed. Then off they went with their treasures safely tucked in their mothers’ purses. 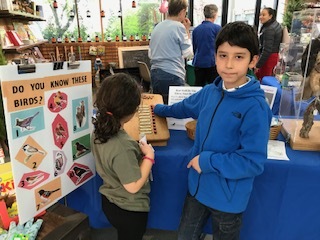 In addition to memorizing birds through the Smithsonian Nature Guide, Deniz also draws them and noted that his renditions have become “more complex as I got older.” Recently he won an award in his age group for a photo at the Puget Sound Festival. With a shy smile, he explained that he was the only competitor in his group. But win he did! His love of all things “bird” and his artistic talent inspired him to sell his drawings on notecards at a coffee house in Kirkland where he raised $400 for BirdNote, the radio broadcast about birds, which later used his voice for a fund raiser. To support Deniz’s efforts to raise money for BirdNote, please visit www.naturesnapz.com. If I had a crystal ball, I think it would tell me that one day Deniz Okurgan will be the director of Cornell University’s Department of Ornithology and an inspiration for all to protect birds and the environment.